With home prices and mortgage rates on the rise, the decision making window for many potential home-buyers is closing. 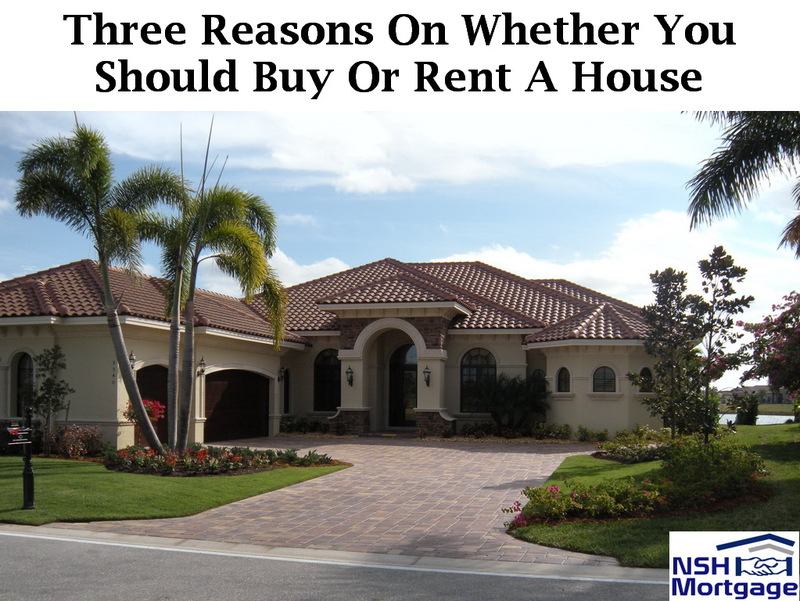 Deciding on whether you should buy or rent a house. NSH Mortgage has the wisdom and tools to help you in deciding which option works for best for you. Should I buy or rent a house, is no longer an academic question. It is a decision many households will want to make before New Year’s Eve. Why the hurry, well the answer comes in three forms. First of all home prices have been climbing with great consistency. According to the National Association of Realtors (NAR), the median existing home price reached $236,400 in March. That is up 6.8% in a year. It is also the sixty-first consecutive month of year with over year gains. Secondly, as these prices increase it spells out good news for sellers who have not yet been offset by rising wages. Home prices have risen by 41% and rents have climbed 17% over the past five years when the typical worker wage has grown by only 11%. Third, rising home values and lagging wages are not a good combination. It is low interest rates which have saved the real estate market, rates which might rise. In the 1970s, they averaged percentage was at 8.9% and in the 1980s, it was at 12.7%. Furthermore, in the 1990s the percentage was at 8.1%. Additionally, in the first decade of the new century it was at 6.3%. This in and around four percent rate is only a recent phenomena from the year 2011 to today. The condition is that even with rates at historic lows. The 3.65% annual mortgage rate observed in 2016 is the lowest on record for 30 year prime financing. In fact, affordability could emerge as a significant problem if mortgage rates continue to increase. We do not know how mortgage rates will move during the next year or two. But even so, some forecasters see higher rates ahead. For instance, the National Association of Home Builders see rates topping five percent in 2018. The problem is that rental units are also increasingly expensive. A report from the Census Bureau shows that the median asking rent was $1,507 in the third quarter of 2016. That is up a whopping $161 over a year earlier. In rough terms, 12% rental rate increases are outperforming the 7.7% home price hikes seen nationwide. For potential home-buyers, the predicament is increasingly dangerous, a report during January found that buying a home is more affordable than renting in 66% of U.S. housing markets. The catch is that marketplace options could change substantially with a rise in mortgage rates. While buying continues to be more affordable than renting in most U.S. markets, that equation could change quickly if mortgage rates keep rising in 2017. Under those circumstances, renters who haven’t yet made the leap to home-ownership will find it even more difficult now. Additionally, renting may end up being the lesser of two housing affordability evils in a growing number of high priced markets. Given rising costs for shelter and stagnant wages, what can be done. For many individuals, the choice of paying higher rent or home prices isn’t a choice they want to make. Instead, they are adjusting their economies by moving from high cost areas to communities where incomes and expenses are more in balance, especially jurisdictions without a state income tax. In addition, home-buyers from high cost states, such as California and New York. While more moved to more affordable states, such as Florida, Texas, Arizona and the Carolinas in 2016. California had the largest number of out-migrants in 2016, followed by New York and Virginia. In contrast, Florida had the largest number of in-migrants in 2016, followed by Texas and North Carolina. In the end the real question is increasingly not owning versus renting, it is also staying versus migrating. These useful trends are more likely to grow if both home prices and mortgage rates rise faster than wages.